A marketing calendar doesn't have to be fancy. I recommend a simple spreadsheet matrix. Across the top x-axis, I place column headings representing the months of the year. Down the y-axis, or the first left-hand column, I list each individual marketing initiative, event or activity I'll use during the plan year. For instance, if I'm going to do a press release every other month starting in February, I would put an X in the February, April, June, August, October and December columns. If I were going to issue a print newsletter once a month, each monthly column would have an X in it for that item. How do you know which activities to include in your calendar? Brainstorm all the marketing ideas that make sense for your plan year but keep in mind that you can't do everything. Balance your marketing workload with the other things you need to do for your business. Plan for what you can do completely, not halfway. Also plan what you feel comfortable with, emotionally and financially. Prioritize accordingly, then place your ideas in your matrix. It allows you to spot "bunches" in your marketing activity. Too many X's close together might indicate the need to spread out your activity. It offers a way for you to spot gaps in your marketing activity. It allows you to more easily evaluate your marketing. Smart advice there from Lautenslager, who is the co-author (along with Jay Conrad Levinson) of Guerrilla Marketing in 30 Days. P.S. 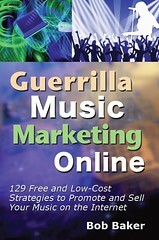 For more in-depth guerrilla marketing advice specifically for musicians, check out this classic book and its sequel.